Chicken and White Bean Stuffed Peppers | Om nom nom! I loooove stuffed peppers, any variety, including my friend Missy’s Inside Out Stuffed Peppers. 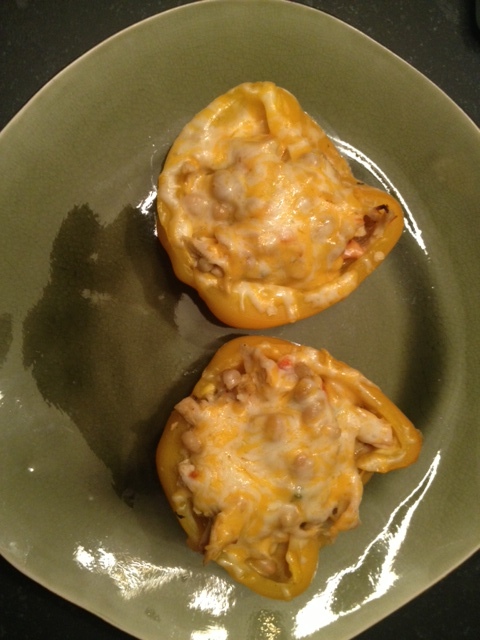 I found this recipe for chicken and white bean stuffed peppers on Skinnytaste and it looked like a winner. I used yellow peppers for this, but any color will do. Also, I had no cooked chicken hanging around, just chicken breasts, so I boiled one and a half chicken breasts in some stock and shredded it – worked out well, and was a good amount for a two-person size dinner. The only thing I changed about this recipe was proportions – there are only two of us, so 5 peppers was a bit too many. All in all, a bright, filling, and tasty take on stuffed peppers! In a medium pan, heat oil on medium heat. Add chopped onions, garlic, parsley and red pepper. Saute until soft, about a minute. Add chicken and season with cumin and adobo. Add beans and 1 to 1-1/2 cups of water and simmer for about 5-10 minutes, until it thickens and the liquid reduces. Adjust spices to taste. Preheat oven to 350°. Cut peppers in half removing seeds and stem. Place peppers in an oven-proof dish. Fill each pepper with 1/3 cup of chicken and bean mixture. Pour about 1/3 cup water or chicken broth on the bottom of the dish. Cover tight with foil. Bake 30 minutes at 350°. Remove foil, top with cheese and bake uncovered another 5 minutes.